De Watson Lake ate Whitehorse passamos pela chamada “continental divide” – ponto em que os dois maiores sistemas pluviais do mundo se dividem – o rio Swift e o rio Rancheria se separam. Na rota passamos por Nugget City – Cidade Pepita – nome bastante sugestivo em função da corrida do ouro ocorrida na região. Seguindo chegamos a “Teslin Deileen-Aayi”...nome oficial = Teslin – que atualmente tem uma população de 450 habitantes e e’ uma pequena comunidade com influencia dos povos Tlingit. Aqui se encontra o Teslin Tlingit Heritage Center com mostras da influencia e cultura destes povos. A região e adjacente aos lagos que formam a nascente do Rio Yukon. Seu nome, alias, provem da inter ligação dos rios e lagos que formam a nascente do magnifico Rio Yukon. A região dos lagos e lendária pelas historias dos povos Tlingit e Tagish e dos exploradores da corrida do ouro do Klondike. Esta região apresenta paisagem diversificada desde dunas desérticas a montanhas, vales e áreas cobertas de pinheiros. Para chegar a Teslin passamos pela Nisutlin Bay Bridge – uma dentre três pontes de ferro permanentes na Alaska Highway. Esta e a ponte mais longa da Alaska Highway (584m) e foi construída em 1954-1955. A área de descanso no km 1242 apresenta um histórico da construção da ponte e da área, como também uma bela vista da ponte e de Teslin. Johnson’s Crossing e Jake’s Corner são outras duas comunidades pelas quais passamos ate chegarmos a Whitehorse – atual capital do Yukon Territory. From Watson lake to Whitehorse we went through the so-called “continental divide”- where two of the world’s largest river systems – Swift and Rancheria Rivers – divide. On the route one passes through Nugget City – proper name for the gold rush that brought “stampeders” to this region. Then we came to “Teslin Deileen Aayi” – official name – Teslin, which today is home to around 450 people who are proud of their thriving community. 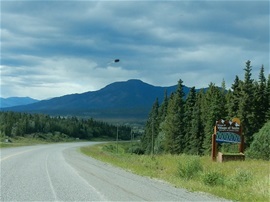 The region is adjacent to the headwater of the Yukon River with forested valleys and slopes and small alpine areas. The legendary Southern Lakes region holds countless stories…from its Tlingit and Tagish-speaking peoples to the stampeders heading to the Klondike, to the adventurers of today. Named for the inter connected lakes and rivers that form the headwaters of the mighty Yukon River, this region is home to diverse landscapes, from desert dunes to rolling mountains. To get to Teslin one comes to and crosses the Nisutlin Bay Bridge – one of only three permanent steel bridges on the Alaska Highway. It is the longest bridge on the Highway – 1,917 feet – and was built in 1954-1955. The rest area at km 1242 provides a scenic view of the Nisutlin Bay Bridge and Teslin. Johnson’s Crossing and Jake’s Corner are two other communities we crossed to get to Whitehorse – present capital of the Yukon Territory.